We just got back from a wonderful week of sailing. The boat was excellent and Richard and Denise were delightful. We had an excellent time. You can recommend CONTESSA without any reservations. Thanks for the connection and hope to do it again (before 60!). Dave & Marci, owner/operators of the charter catamaran Godiva, would like to announce a $500 discount for honeymoon charters. What better way to spend your honeymoon than to lazily sail around St. Martin and St. Barths on your private yacht? Discover that secret cove where you can swim or snorkel off the boat. Dine in casual elegance in the spacious cockpit while Captain Dave serenades on guitar. Snorkel off Rocher Creole and be part of nature's tropical aquarium. Lay on the trampoline and count the stars overhead. We've put a few more stars in the sky for your honeymoon! As our honeymoon guests you will have the port (left) side of Godiva to yourselves. That's two cabins and bath. Come experience the romantic Caribbean on Godiva and make memories that will last a lifetime! Godiva is a 42-foot Fountaine-Pajot, Venezia catamaran and accommodates up to four guests in two cabins (port hull) with a shared head/shower in between. Godiva is based in St. Martin and is available for charters in the Leeward islands... St. Martin/ St. Maarten/ St. Barths/ Anguilla area, Antigua, Guadeloupe, Martinique... They will also be participating in the Antigua Races April 24 through May 4th, 2008! GODIVA is still available for a CHRISTMAS and/or NEW YEARs charter! Book Now!!! View Godiva's brochures : CLICK HERE and HERE TOO! Looking for a different area to cruise this year? How about a yacht charter South East Asia or Indonesia? 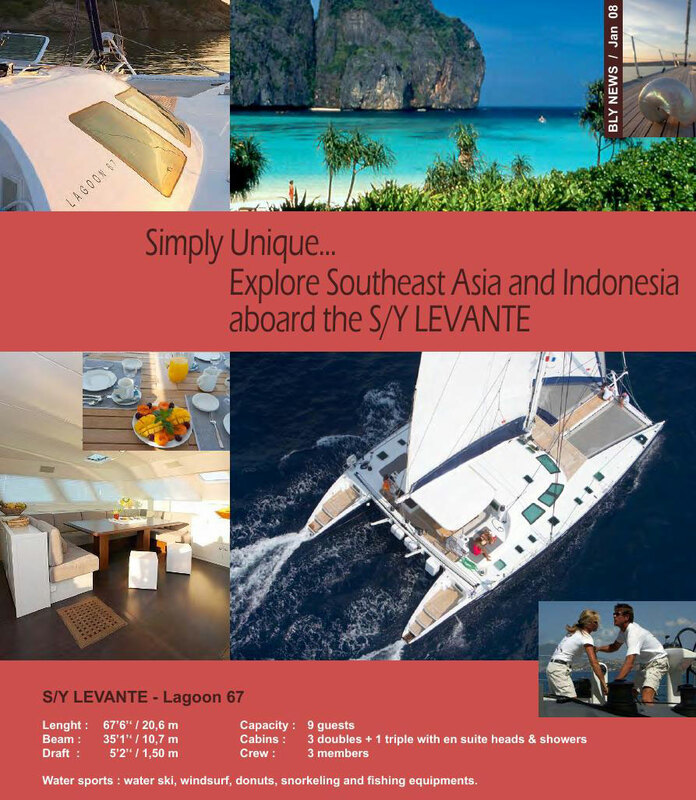 Levante is a 67-foot Lagoon catamaran available charter in this exciting, "new" destination. Levante is fully air conditioned and accommodates up 8-9 guests in 4 cabins. MATAU, a 75-foot catamaran, is a new addition to the yacht charter fleet. Matau accommodates up to eight guests in four luxurious staterooms and will be available for yacht charters in the Mediterranean for Summer 2008 and will return to the Caribbean for charters for the Winter 2008/9 season. When you step inside MATAU, you will notice that her stunning décor has more than a dash of art deco style with pale wood, white leather upholstery and sophisticated black and red accents. The perfect setting for cosmopolitans and martinis with Noel Coward songs playing in the background. Four very spacious cabins (3 Queens & 1 King) accommodate up to eight guests in full comfort. The ensuite baths feature twin vessel sinks and separate stall showers. Exceptional is the word for the king-bedded master stateroom. Its en suite bath, as large as one of the guest cabins, offers the luxury of a full-size jacuzzi tub. There are so many choices on deck – the trampolines, aft deck, bridge deck, the “teak beach”, and broad aft steps (very easy water access!) – that everyone will quickly find their own favorite spot for sunning and relaxing. Captain Brett Clarke and his wife, Chef Andrea, are very excited about chartering in the Mediterranean this summer and look forward to welcoming guests aboard this very special yacht. Bankie Banx, the Eastern Caribbean's pioneer of reggae music, hosts the Moonsplash Music Festival each year on Anguilla. This year's Moonsplash runs March 27-30, 2008 at Bankie Banx's Dune Preserve on the Caribbean island of Anguilla (just north of St. Martin / Sint Maarten). Moonsplash has become much more than a weekend party. People plan their vacations to Anguilla around it. Looking for accommodations? How about a yacht charter? Jet Blue and Spirit airlines, along with major airlines fly into St. Maarten (SXM). Meet your boat in St. Maarten, and make the short sail up to Anguilla to attend Moonsplash. Afterwards, you might enjoy cruising on over to St. Barths stopping at various spots along the French coast of St. Martin on the way. Last year, we sailed over to Anguilla to attend the Jimmy Buffett concert and had a wonderful time. What a wonderful venue for a concert of this type. Check out the concert video on Amazon.com... CLICK THIS LINK! A double CD and an 82 minute DVD were recorded LIVE at the Dune Preserve, Rendezvous Bay in Anguilla, in Bankie Banx's backyard and the site of famous Moonsplash Festivals. The CDs include 30 songs, all of your favorites, plus some special in-concert rarities like Domino College, Waiting In Vain, When Salome Plays the Drum, King of Somewhere Hot, Treat Her Like A Lady, and Distantly In Love. The DVD was recorded in High Definition and is in Dolby 5.1 Surround Sound. Check out the video on Amazon.com! There's not much time so BOOK NOW! YES DEAR is now offering crewed charters in the Grenadines this August, September, October and November 2008. The Grenadines offer a rhythm of island life reminiscent of days gone by. Experience their peaceful beauty aboard a luxurious catamaran with your own private crew guiding you through this unique tapestry of laid back islands. Explore the Tobago Cays, a chain of five deserted islands protected by a pristine horseshoe reef famous for snorkeling and diving. Linger on Mustique, hideaway for the rich and famous. Enjoy afternoon tea at the elegant Cotton House or sip cocktails as the sun sets at Basils. Bequia has a rich history of whaling and traditional boat building, step back in time and learn how these Islanders lived and worked. Grenada is known as the Spice Island, the home of nutmeg and many other local delights. Hike through Caribbean rain forests, visit spectacular waterfalls, and meander through colorful local markets. The Grenadines offer something for everyone with an unforgettable taste of Island life. YES DEAR accommodates up to 10 guests in 5 cabins with Queen berths each with its own 17-inch digital television with built-in DVD and CD player. Lots of toys! How about a sailing/diving charter aboard Promenade this autumn? Take advantage of chartering Promenade by the cabin, instead of booking the whole boat! GOOD NEWS! Promenade will re-open this week for cabin bookings if we can book TWO cabins and we already have ONE!!! This is a wonderful opportunity for couples (especially divers) to charter such a fun yacht with oodles of toys and lots of space for an affordable rate. Promenade is a custom 65-foot trimaran. Rich & Lisa are captain & chef, plus they have an additional crew member, or Kerry & Bazza might be aboard! Promenade is air conditioned and has five guest cabins: 2 kings and 3 queens. The two king cabins may also be made up as singles, if requested. The two forward queen cabins have ensuite heads, while the aft queen and king cabins share two heads. Promenade has a 14-foot dinghy with 50HP motor, waterskis, kneeboard, tube, several kayaks, 5-person banana, snorkeling gear, fishing equipment, underwater scooters, projection TV/VCR/DVD in salon, a portable DVD player, Game Boy, Play Station 2, dedicated guest computer for email access, compressor to fill scuba tanks. Maybe, if you are good, Lisa will make you some of their famous homemade ice cream! Promenade has dive instructors (PADI & NAUI) and offers diving to certified divers at $125/diver. Guests may bring their own equipment or rent gear for $125/week. Resort/Discover Scuba available, along with other instruction... inquire for current rates. Promenade only has a few weeks available for winter 2009.